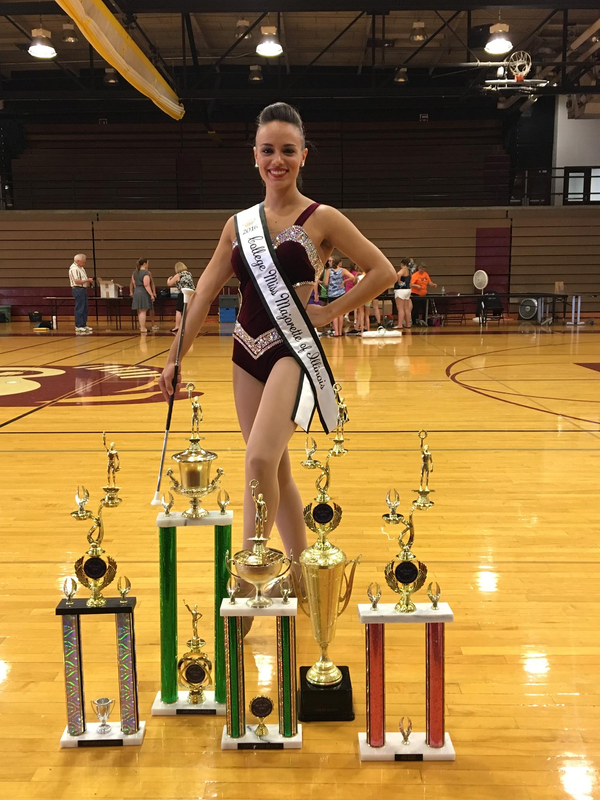 CollegeMarching is happy to introduce Juliette Makara, feature twirler at Southern Illinois University for this week's #TwirlerTuesday! Read on to hear her story! If you are interested in being featured as a part of our #TwirlerTuesday series, send us a note and we will take it from there - cmbtwirl@sullivation.com. CMB: Tell us about yourself! JM: My name is Juliette Makara and I’m from Arlington Heights, Illinois (Chicago suburb). 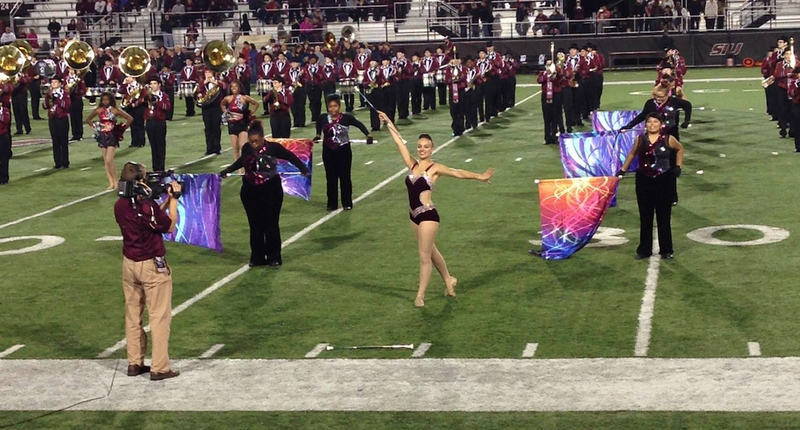 I’m currently one of the Feature Twirlers at Southern Illinois University with Jazmin Randazzo. I am majoring in Sports Administration with minors in art and dance and will be graduating in May 2017. I plan to pursue a Master’s degree in Sports Management. I have been twirling since the age of 7. I started twirling in a park district class. The teacher invited some of the girls on her team to practice in the corner of the gym and watching them automatically amazed me. I told my mom I wanted to be able to twirl like the girls one day. Since then twirling has been my passion and I’ve been able to share my love of it with my younger sister and duet partner. I’ve competed at the state and national level. I’ve won many state and regional titles with the help of my coach, Nicole Morris (Hendricks). Currently I’m a member of the Silver Knights Baton Corps, 2016 Junior Twirling Corps National Champions, under the direction of JoAnn Britton and Wendy Kuminowski Diehl. CMB: What is your favorite memory being a part of your college marching band? JM: Being a part of the SIU Marching Salukis is so much fun! I’ve made many friendships with band members, graduate assistants, and my band directors that will last a lifetime. 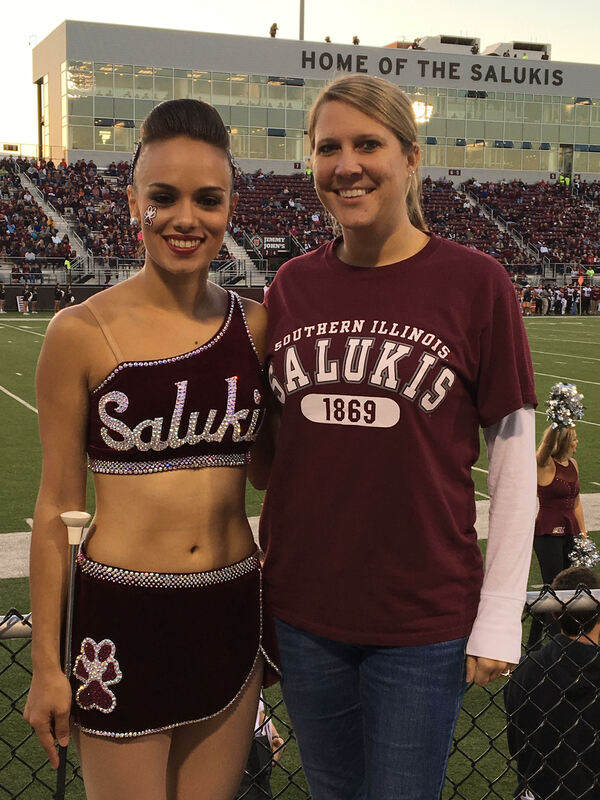 One of my favorite memories was during my first football game my freshman year when they announced me as the SIU Feature Twirler. It was at that time when it really set in my mind that my dream came true of becoming a feature twirler for my school. CMB: What is your favorite accomplishment in your twirling career and tell us what it took to achieve that dream? JM: Two years ago I was preparing for the Miss Majorette of Illinois competition and a week before I had to go to the hospital due to kidney stones and pneumonia. I was hospitalized for 6 days and had surgery, but all I could think about was how could I be able to twirl at the competition. After getting out of the hospital I only had two days before the competition. My coach and I had to alter some of my routines to be able to twirl. I competed and won the title of 2014 College Miss Majorette of Illinois. I was so determined to twirl and pushed myself like I never did before which made this my biggest twirling accomplishment. Representing SIU was just icing on the cake! 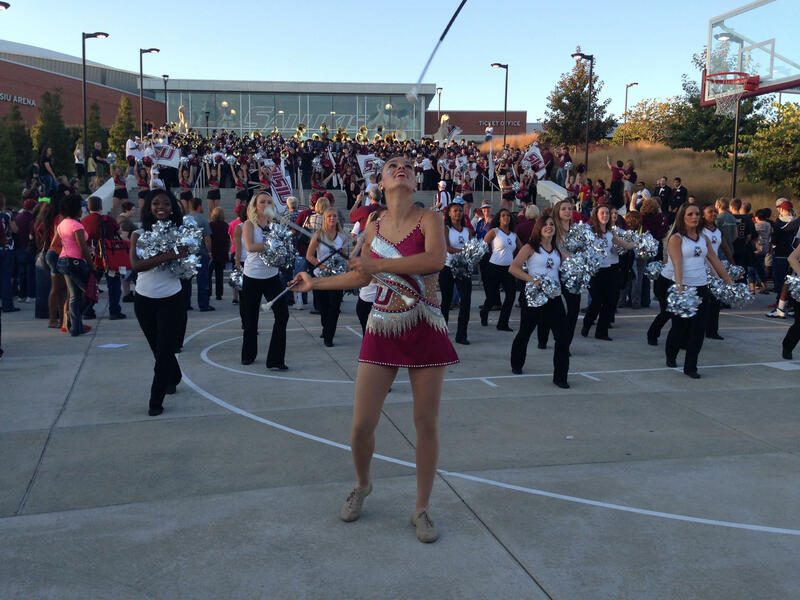 CMB: What advice do you have for high school-aged twirlers in deciding a school to go to? JM: Keep your mind open! Twirling in college is a huge honor and a dream come true. But you must remember academics come first. So consider schools based on your intended major first, then twirling as a bonus. Make sure you submit everything on time and always follow up with am email or phone call making sure the band director received your audition tape and/or paperwork. Auditions may be stressful but remember everything happens for a reason. Lastly, chose the school where you think you will feel at home because it will be your home away from home for the next 4-5 years of your life. CMB: What is one thing that you always have to do before a game starts? 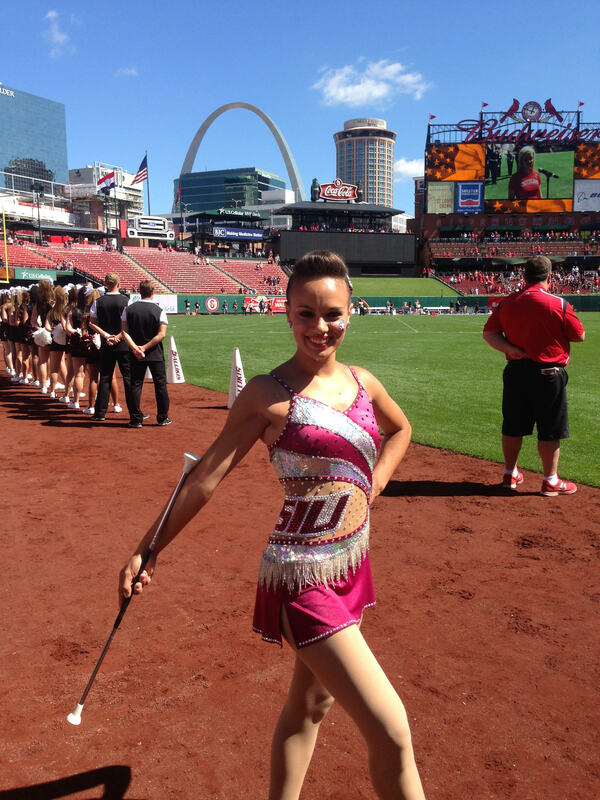 JM: The other SIU Feature Twirler, Jazmin, and I always wish each other good luck. I also retie my shoes two or three times to make sure the laces won’t come undone. CMB: If you had to live on one food for the rest of your life, what would it be? JM: My mom always finds me raiding the refrigerator at home because I love to eat! But I would probably live off of chicken for the rest of my life. 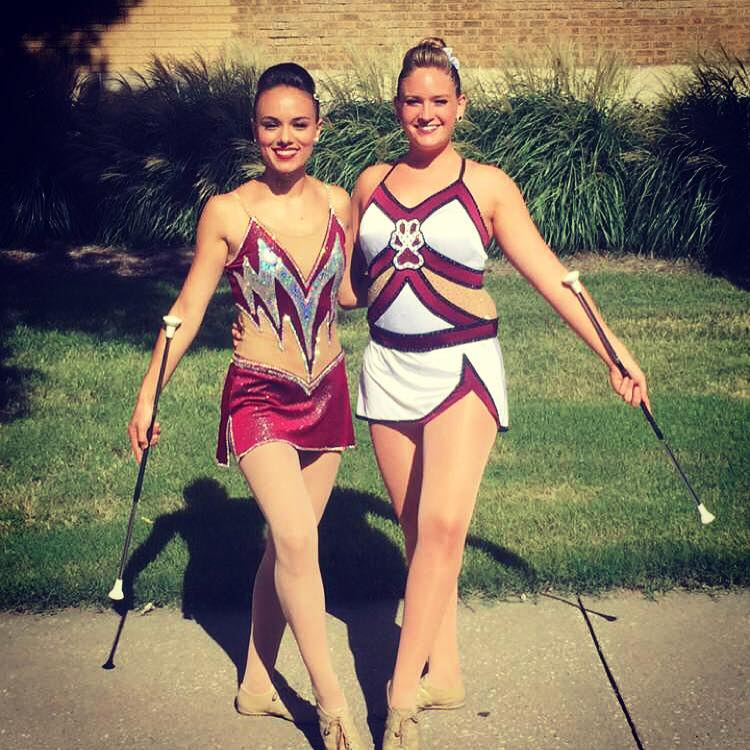 CMB: What advice do you have for other college twirlers? JM: Take advantage of your time and opportunities in college because time goes by fast and it will be over as soon as you know it. Always pursue excellence in your twirling and in your academics. And being a feature twirler for your school means you are also a role model for young twirlers and children, so make sure you have a positive attitude and outlook! CMB: When you were a young twirler, what college twirler(s) did you look up to, where did they twirl and why did you admire them? JM: I had always admired MerrieBeth Carlson (Cox) when I was growing up. Watching her twirl at Purdue made me really excited about twirling in college. CMB: What are the next steps for you, inside and outside of twirling? JM: After graduating in May 2017 I will be competing for one last time at AYOP in July. It will be sad but I know that this won’t be the end of my twirling career because I will still be teaching young twirlers	and helping them to be the beat twirler they can be. I am looking forward to earning my Master’s degree Sports Management. I absolutely love football and want to work around it. One day I would like to work for an NFL team in the marketing department.